← Reginald VelJohnson in Uniform Moment of the Week: Who You Gonna Call? Okay, well, this doesn’t even approximate the level of Boston Rob vs. Russell, but it’s intriguing nonetheless, as the new season of Celebrity Apprentice will pit the original Survivor winner against one of our guiltiest pleasures (they’ll also be competing against La Toya Jackson, Jose Canseco, Mark McGrath, David Cassidy, Dionne Warwick and (gulp) Gary Busey, among others). Truth be told, we didn’t get into Survivor until the second season (The Australian Outback), so we have no particular allegiance to Hatch (in fact, we somewhat resent “the snake” because we think he gets too much credit for defining how the game is played; people would have figured out to lie and manipulate sooner or later), but the presence of Meatloaf might just be enough to get us to tune in (briefly). When Jumped the Snark was young we had an obsession with “I would do anything for love” (thanks, in large part, to the videos frequent play on VH1), and we soon played out both sides of Bat Out of Hell 2: Back Into Hell on our Walkman. In fact, we once cleared a basement at a friend’s birthday party by belting out a rendition of the tune (perhaps we shouldn’t have done the female parts too). But we loved that song, and we loved that album, and until we entered our prolonged Billy Joel phase in middle school Meatloaf was our favorite (along with Weird Al). 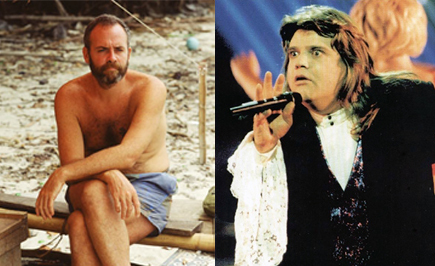 And we still include”See Meatloaf live” on our list of things to do before we (or he) die. Oh, and our prediction: Mark McGrath will NOT win.